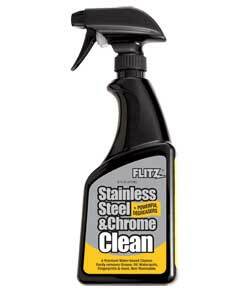 Flitz Stainless Steel and Chrome Cleaner with Degreasing Agents is a Revolutionary New formula that safely Cleans and Protects Polished and Brushed Stainless Steel, Chrome, Enamel and Porcelain. Removes: Fingerprints, Grease, Oil, Water Spots, Soap, Wax, Insects, TreeSap, Road Tar and Much, Much More! Leaves no Oily Residue. Streak-Free. Will not Attract Dust or Fingerprints. Safe and Easy to Use. Removes the Oily Film left by Other Products. Great Maintainer. Cuts Through Cooked or Baked on Grease. Water-based Formula. Will not Discolor Stainless Steel to Grey. Use with Flitz Microfiber Polishing Cloth for Best Results. BOOKMARK THIS PAGE STAINLESS STEEL CLEANER WITH DEGREASER 16oz.